Rethinking Faith and Church: Is Gambling and Games of Chance Controlled by God? 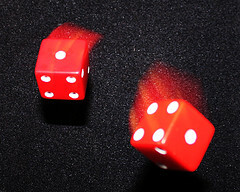 Is Gambling and Games of Chance Controlled by God? I’m not a gambler, and this is not intended as a judgment call on those who are gamblers. From time to time I’ve even bought the odd lottery ticket and I’ve had fun imagining what I might do with the winnings if “my numbers” were by chance to come up. But, to use gambling terminology, I am the most “unlucky” person at games of chance. As the expression sometimes goes, I couldn’t win anything “if my life depended on it.” Oh well, I’m really quite OK with that. In truth, though we often use words like “luck,” or “lucky,” is there really such a thing as that? Is one person more “lucky” than another person? Personally I really don’t believe so, even if I tend to sometimes use that word. This became very clear to me on my 2009 trip to Sturgis when I used the word “lucky” and was promptly chastised for it by a dear Christian sister that I only just met. (You can read about that in my Sturgis memoirs here). I now prefer to use the word “providence.” Some might say it’s only semantics, but I don’t think so. For those not familiar with the word “providence,” I think it is best defined as God’s divine care and preservation of all creation, including mankind’s needs, according to His sovereign and intended purposes. Providence is a rich word that we don’t seem to use very often anymore. I wonder why that is? The question for me is, where and how do I expect to get my needs met? Are they met through lotteries and other games of chance, or by the providence of God? It is true that God can meet all our needs in any number of different ways, and He often does. Probably for most of us our needs are met when we go to work and earn a paycheck. However, God isn’t limited by our working for our sustenance; He can use miraculous methods as well, such as the feeding of Elijah by the ravens (1 Kings 17:6). And if we use the same line of reasoning, I suppose that God could also use lottery winnings to provide for His children. What am I getting at? I see an important theological lesson here, namely that God is actively involved in every aspect of our lives, even the game of chance. Is it beyond the realm of possibility to assume that, just as the disciples cast lots to determine Judas' replacement (Acts 1:26), that God cannot determine the outcome of those lots they cast? The question is not so much one of my being “lucky” as it is one of God’s will for my life. Could it be that God allows or even wills a certain person’s “lucky numbers” to come up while at the same time disallowing it for the next person? I wonder. And while I’m on that same train of thought, please allow me to digress a little. Could it not be that God is still so involved in the world even up to and including natural disasters and wars? Now there is a loaded question that is certain to get some people upset. Forgive me if I’ve stirred those emotions in you; I mean no harm or disrespect. I can only see one of two possible answers here. Either God is still fully 100% involved and in control of the world, or He is not at all involved any more and has simply let the world spin out of control on its own. I cannot imagine any other scenario in the middle somewhere. It’s all or nothing. I believe that God is fully in control, despite the fact that He has also given us a measure of dominion over His creation (Genesis 2: 19-20), and thereby, a measure of free will. How then could we reconcile all those horrible events of history? Why would a God that is so infinitely in love with you and me permit (or cause to happen) some of those tragedies of human history? I don’t pretend to have an answer to that. Maybe that’s where faith comes in. One thing is for certain, and that is that God does love us very, very much (see John 3:16). As for reconciling all my “whys” of human tragedies, I am at peace with the question when I remind myself of what the Apostle Paul said in 1 Corinthians 13:12-13, “Now we see but a poor reflection as in a mirror; then we shall see face to face. Now I know in part; then I shall know fully, even as I am fully known. And now these three remain: faith, hope and love. But the greatest of these is love” (NIV). Why do things happen as they do? Why do some people seem to have all the “luck” whereas others continue to decline in their poverty? Why are there massive tragedies and great losses of life around the world? Why? Why? Why? I don’t know. I wish I did know, but I don’t. But while I may not know what tomorrow holds, I do know who holds it – my Heavenly Father does.